realtyWW is an international real estate advertising website. To post real estate listings please follow this page Owners, wishing to attract maximum of attention to their real estate listings, usually pay too much attention to creative ideas and are not thinking about the correctness of the listings compilation. This article is to tell you about the most important factors when writing real estate listings. The text of any real estate listing is to contain all the necessary information about the object: the address, the number of rooms, the living area of the object (both general and residential), the size of the kitchen, the bathroom information and so on. When writing real estate listings it is also important to focus on the transport accessibility. An important point when writing real estate listing is the legal status of property: how long an object is owned, how many owners the object is owned by, and how many people is registered in the object, and whether or not this transaction is an alternative one. With regard to the real estate rental listings, it is built on the same principle as the property sale ads, but here you need to put emphasis on some of the nuances that are not so important when selling. Firstly, you need to write about the lease period: daily, several months or durable. Secondly, describe in detail the condition of the property: the repair, the presence of furniture and appliances, cable TV, or digital television, access to the Internet. And in order to reduce the number of unnecessary calls, it is desirable to immediately indicate the wishes for the future tenants “rent an apartment for couples”, “no pets”, “possible with children “. If necessary, specify the maximum number of occupants, the attitude towards young children, the elderly and pets. Be sure to indicate at the end or in the beginning of listing the contact information of seller: name, phone, desired time to call. In the text of the real estate listing for lease or sale, it is necessary to have an “anchor” to describe the features of apartment or house, on which you can focus the buyers. For example, if the apartment is a good repaired one, it is necessarily to emphasize on it, but do not forget to indicate the repair works date and give them a short list. Often, the buyers are interested in, for example, where the flat windows overlook. You can make a positive focus, for example, that the apartment is light, because the windows are overlooking the sunny side, or silent when they go out into the yard. When describing the “anchor” it is preferable to avoid the dry language and to use short emotional phrases. With their help, you can faster “reach out” to the client. The main principle is nothing that all the needed information should be given in a positive way and not to contain useless info. In order to make real estate listings attractive for buyers, they should be unusual, memorable and unformatted. For example, an ad with the headline “Buy an apartment and get a gift Cat” will at least attract the attention of a potential buyer, and he will go to a page to read the object description. However, not all the catchy phrases can be used when writing real estate listings, some will have a totally opposite effect and will frighten off the customers. For example, if you specify that “beside is the multi-lane road without traffic jams”, which means the presence of a constant noise of cars and air pollution by exhaust gases. It is unlikely that it will be interesting to the buyer. The same situation is marked with “overlooks the school playground”, “forward-looking, actively built up area.” In the latter case, the “truth” is not likely to work, because no one wants to live a few more years on the construction site. In addition, you have to be careful with wording such as “pedestrian access to the station from where you can easily go in any direction.” This phrase seems to be talking about good transport accessibility, but on the other hand may be associated with dirt, large flows of people, or even worse – with complex criminal situation place. Often, the buyer, viewing real estate listings, perceives them as a picture, including the text part, provided that the font chosen wisely. Therefore, in the real estate listings is better thing to use normal and comfortable for the perception of fonts such as Arial, Times New Roman, Calibri. It is better to avoid exotic options, because those real estate listings simply are difficult to read. For highlighting, more preferable to use standard methods, for example, italic, underline, or bold. It is better to show creativity in the presentation, as has been said, it sets the buyer to the desired fashion. 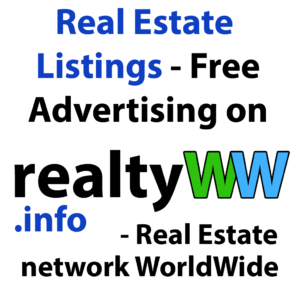 Not all sites can allow their customers to change the font of real estate listings, while it is possible on realtyWW. Price is one of the most important points of real estate listings for sale or lease. For a successful sale, it should be average or slightly lower than at the area. If you want to quickly sell an apartment, it is not necessary to write in the declaration about “urgent sale”. On the one hand, it is perceived by consumers as a possible fraud on the part of the owner. On the other hand – Customers can apply for an additional discount. It is obvious that neither the one nor the other option is unfavorable for the seller. Real estate listings about selling, lease must be accompanied by a photograph of good quality. To avoid various incidents, I suggest you take a picture in front of flat after getting out, because the pictures of rooms, where things are scattered and in disarray, can invoke a feeling of revulsion and antipathy. The photographs must be sealed for all the rooms in the apartment, for the house itself, it is desirable if the windows offers a good view. Also it will be a good idea to take a photo of houses in the adjoining spaces. Plus, the photo should reflect the availability of built-in furniture in the apartment, storerooms or closets, niches for storage, loggias and balconies, if any. This entry was posted in Real Estate Advertising and tagged Free Real Estate Listings, International Real Estate Listings, International Real Estate Listings Free, Listings, Listings Real Estate, Online Real Estate Listings, Post Real Estate Listings, Post Real Estate Listings for Free, Property Listings, Real Estate, Real Estate Agency Listings, Real Estate Agent Listings, Real Estate Company Listings, real estate listings, Real Estate Listings for Rent, Real Estate Listings for Sale, Real Estate Listings Free, Real Estate Listings Online, Real Estate Listings Website, realty listings. Bookmark the permalink.